I’ve previously blogged about what it’s like to keep our office kitchen stocked. The TL;DR version is this: I make multiple trips weekly to Costco and Target and buy a whole lot of LaCroix. Yes, it’s true that we consume a lot of food at our office, and of course we do! It takes a lot of calories to power 30-something brains, day-in and day-out! I don’t get in my car and and drive to Costco and Target for my epic shopping trips blind, however. There’s a lot of preparation that goes into keeping the kitchen stocked and my shopping lists written, and part of that process is done through a crowdsourced list found on what we have dubbed the Magic Whiteboard. I really do want everyone here to have the thing they want available to them. If it’s going to keep someone fueled and focused on their work, I want to make sure it’s here in the building, so I’m often encouraging folks to be specific so that I can keep the magic alive. 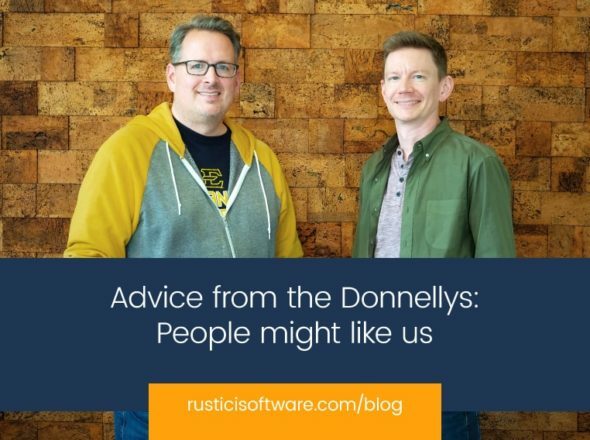 Aside from the food that I keep stocked in our office, there’s also a couple of food rituals and traditions here, like Chipotle Thursdays, when a sizeable number of Rusticians carpool to Chipotle, grab food to-go, and eat it together at the office for lunch. This happens every Thursday, and has for going on something like 7 years now (as guesstimated by Joe). We also often typically have Satco (aka San Antonio Taco Company) catered for lunch on the first day of our Quell weeks, and then there’s the fun part of my job, which are the unexpected, spontaneous, ‘just because’ treats. These treats often look something like picking up cupcakes because it’s the first Friday of summer. Or taking orders for Culver’s, Coldstone or Jeni’s because it just sounds like a good day for ice cream. Or sometimes I just see a cheesecake at Costco that looks appetizing and buy it, and make everyone help me eat it. What I love about the unplanned treats is that they are a fun (and delicious) way to coax everyone out of their offices and around a table for just a few minutes, laughing, chatting and enjoying a snack. The most important work I do on any given day are the things that make people’s lives easier and their time spent at work a little bit more enjoyable, and it turns out that cupcakes, ice cream, princess bandaids and Kombucha are really easy ways to achieve that. Who knew? !